Herbal Purifying Laxative™ - 525 mg, 60 Vcaps™ each (Nature's Wonderland) - Penn Herb Co. Ltd.
Get going again for a renewed, refreshed feeling. 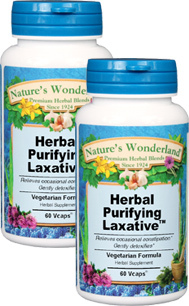 Herbal Purifying Laxative™ is a time-proven herbal blend for natural relief: SENNA...stimulant laxative relieves constipation; MALVA, SAFFRON & PEPPERMINT…soothe gastric upset and prevent intestinal cramping; also alleviate gas & bloating; UVA URSI, LINDEN & ELDER FLOWERS…supports normal kidney function and urinary tract health; BUCKTHORN AND PANSY LEAVES…promote bowel regularity. Senna Leaves, Buckthorn Bark, Elder Flowers, Linden Flowers, Pansy, Malva Flower, Peppermint, Saffron, Uva Ursi; Plant Cellulose (Vcaps™) - vegetarian capsules. As an addition to the diet, take 1 or 2 capsules 3 times daily with water at mealtimes. DON'T USE IF YOU HAVE ABDOMINAL PAIN OR DIARRHEA. CONSULT A HEALTH CARE PROVIDER PRIOR TO USE IF YOU ARE PREGNANT OR NURSING.